Our garden is teeming with tomatoes right now, so we’re piling on the tomato sandwiches, making sauces and even drying them for use this winter. In all the tomato madness, we also came up with this yummy casserole. The day before a potluck, we were looking at the ingredients we had available and put this together. It was a very particular potluck, too, as the food had to be not only vegan, but also contain no salt, oil or sugar. This style of eating, known as “SOS-WFPB” (meaning no Salt Oil or Sugar -Whole Foods Plant-Based) is often employed to control or prevent serious health matters and is supported by a lot of famous vegan doctors, like the guys in the Forks Over Knives film. Cooking with no salt, oil or sugar can be a challenge, but we welcome it. With this recipe we used techniques like cooking the rice with sun-dried tomatoes and layering on fresh herbs to really amp up the flavor. That way, you’ll never miss the added salt, oil or sugar. Give this recipe a try; you just can’t miss with fresh, in-season tomatoes! Bring water to a boil in a large pot, and add rice and sun-dried tomatoes. Cover and return to a boil, then lower heat to a simmer. Allow rice to cook, covered, until all water is absorbed, about 20-25 minutes. 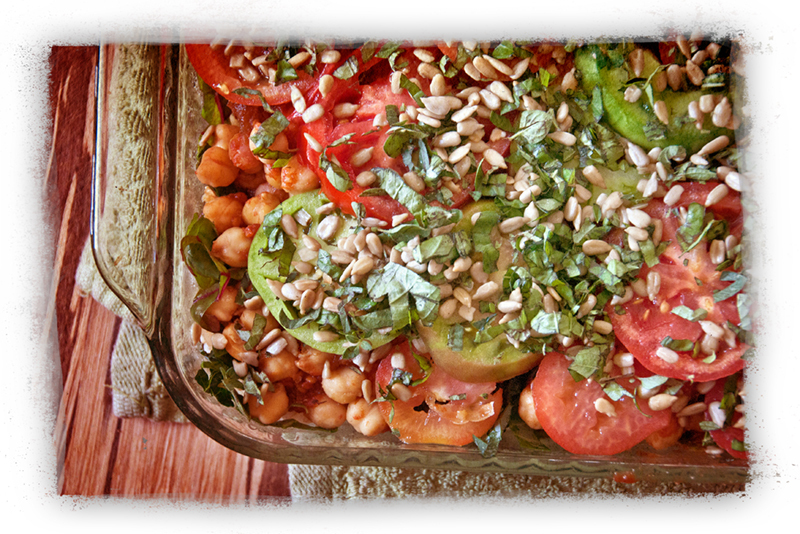 In another pot, combine canned tomatoes, chickpeas, balsamic vinegar and minced garlic. Simmer over low heat, stirring occasionally, until sauce begins to thicken, about 12-15 minutes. While rice and sauce are cooking, slice Swiss chard and set aside. In a small bowl, combine chiffonade-cut basil and oregano with sunflower seeds. This will be the topping for the casserole. When rice is done, remove sun-dried tomatoes and slice them into small pieces. Stir sun-dried tomatoes to the sauce. Pour rice into a 9×13 casserole and top with sliced Swiss chard. Layer on the cooked sauce, spreading evenly over the rice and chard. Next, add a layer of sliced fresh tomatoes. Complete by sprinkling the casserole with the herb-sunflower seed topping. Serve warm.